Birthdays seem to come round quicker and quicker each year. My next birthday is tomorrow? How? It only seems like two mins since the last one. I'd booked today off work, mainly just to chill out and do nothing but we did pop out for a while. As I was unlocking the door the postman was a few doors down and shouted, excitedly I've got a parcel for you. Ok Mr Over excited postman, I'm only expecting the next You Beauty box and believe me that really isn't that exciting! Ah ok Mr Postman, this does look quite exciting! I'll forgive his enthusiasm and join him in feeling excited. I used the biggest knife we've got to burst through the tape and ooo'd all the while. I'm a sucker for pretty packaging and if you tie something up with brown paper and butchers twine I may love you forever. 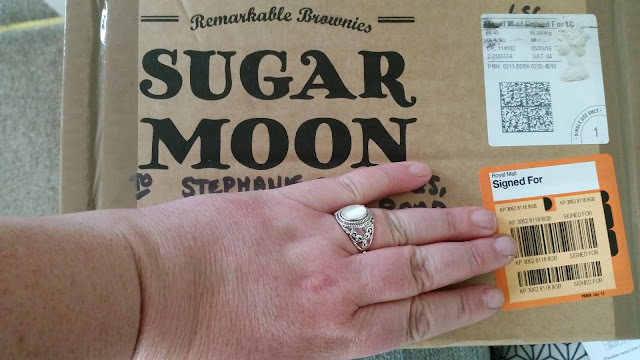 Which is exactly how these Sugar Moon Brownies arrived. 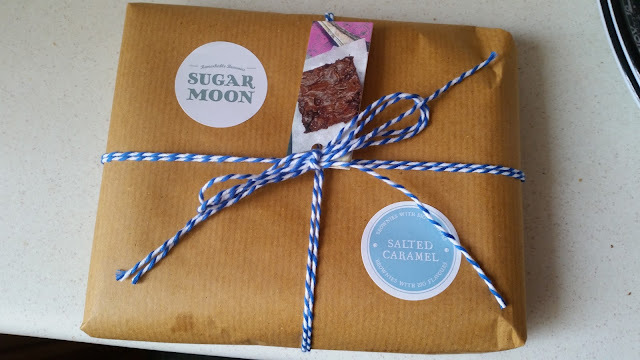 If you then fill said brown paper and twine with Salted Caramel Brownies and post them to me for my Birthday I may well love you for ever and ever and ever. So while my birthday isn't until tomorrow it would have been rude to have waiting to try them. A huge thank you to my lovely friends Rebs who sent me this amazing birthday surprise. 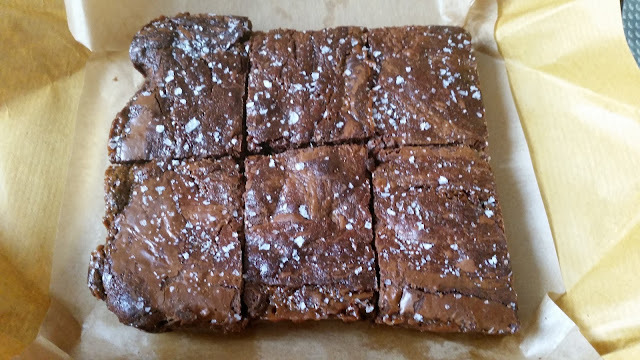 We ate the brownies as they were but you do get a sheet of paper listing the ingredients which mentions microwaving them for up to 15 seconds and serving with icecream (Hello!). It also says they will keep for up to a week in an airtight container or you can freeze them for up to a month. I doubt they will last a week in my house and that has nothing to do with the quality of the product. It's birthday week, all the food all the yums. I also wouldn't subject these delicious squidgy slices of heaven to the depths of hell that is my freezer. Not even the freezer drawers want to be in there! I was so excited this afternoon and I tweeted and instagrammed everything. Suagr Moon tweeted me almost instantly, which is amazing. I love companies who interact and you can really get a sense of how much they love their product. I have been looking at other flavours and I quite fancy trying the chocolate orange ones next, then maybe the toasted pecan ok all the flavours. 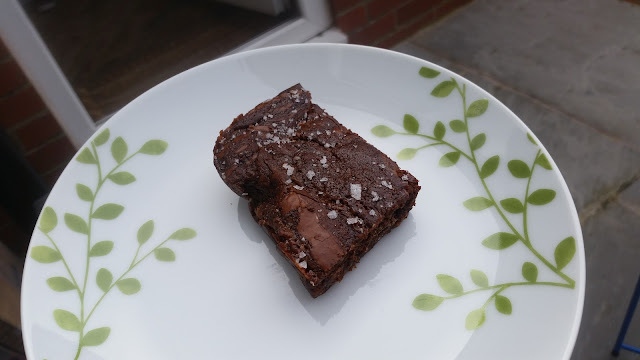 While I've been writing this post I may have placed an order for a box of the chocolate orange ones for my mums Birthday which is next week.